Liberation. That’s the word that comes to mind for 2015. The reason is because so many who were bound in spiritual darkness found freedom in Jesus Christ last year—thanks to the tireless efforts of our small army of dedicated national missionaries around the world, and thanks to you who gave to make their work possible. Jesus Christ, the name that sets so many free, is why the National Missionary Ministry exists. The mission of the NMM is to make disciples and set the spiritual captives free by empowering faithful indigenous missionaries to carry the Good News to their fellow countrymen. Those countrymen are often scattered throughout hard-to-reach villages and ensnared in centuries-old spiritual deceptions. And those deceptions result in broken families, illnesses, poverty, drunkenness and enslavement. 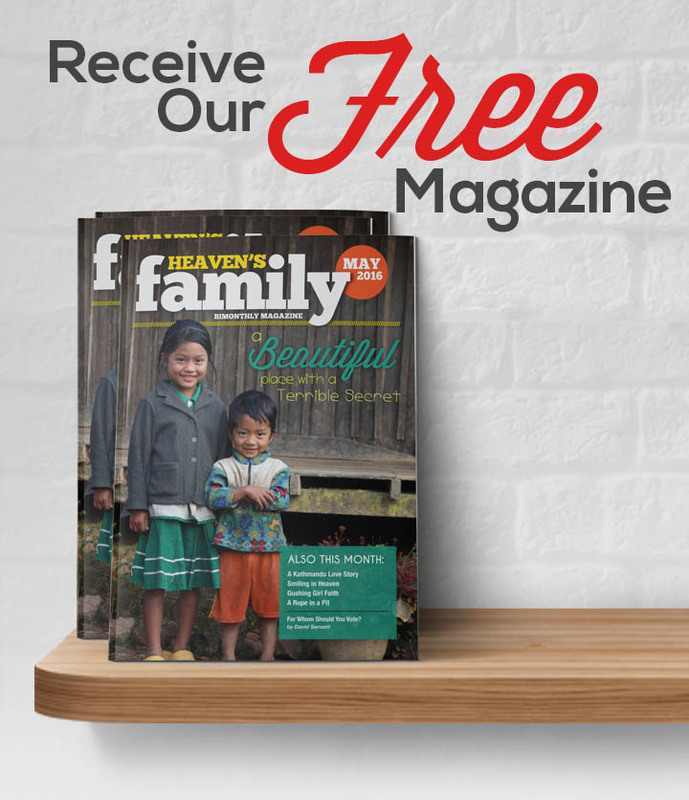 Through your partnership with this ministry, Heaven’s Family invested nearly $150,000 last year to support the growing work of about 50 indigenous missionaries throughout China, Cuba, India, Kenya, Mexico, Myanmar (Burma), Nepal, Pakistan, Sri Lanka and Zimbabwe. • Dozens of Bibles for Burmese evangelists; and the funds to hold multiple evangelistic crusades throughout Nepal and Myanmar. Last year I was blessed to travel to Cuba to meet with indigenous missionaries to develop a vision for how we can better help them reach their communist island with the liberating gospel of Christ. Thank you for your invaluable partnership in 2015. You helped liberate many people last year, giving them the gift of everlasting life. In my book, you are a hero. This ministry would not be possible without you.